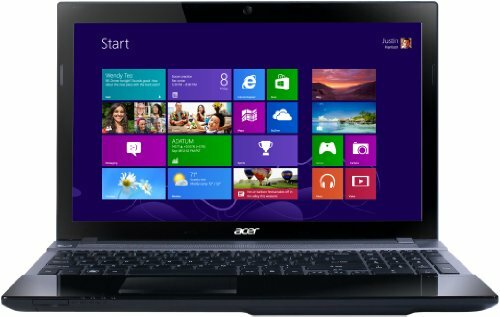 Below is our review of the Acer Aspire V3-551, a 15.6" laptop, featuring 6GB RAM, 500GB hard drive and Windows 8. The exterior of this laptop is finished in a neutral glossy black shell - which looks smart out of the box. The benefits of purchasing a relatively plain looking laptop are that it is less likely to look dated. The downside of a glossy finish however, are that it will show fingerprint marks -0 so if this kind of thing annoys you then you may wish to choose a matte finish instead. The V3-551 is based around at AMD processor - the A6-4400M, which is a mobile dual-core processor which has been designed on the Trinity platform. Launched in the first half of 2012, it succeeds the Llano A-series of Accelerated Processing Units. This processor incorporates a 2.7 GHz CPU, which can be increased up to 3.2GHz with Turbo Core, and also features a Radeon HD 7520G GPU. In terms of RAM, it features a rather generous 6GB, which is backed up by a solid 500GB hard drive. Operating at a rate of 5400rpm, this hard disk should have enough storage for the majority of users - although those requiring a little extra will be pleased to note USB 3.0 connectivity on this laptop - thus giving you high speed access to an external hard drive (although you'll obviously need to purchase drive this separately). The display, as mentioned, measures 15.6" and is labelled by Acer as part of their "HD Acer CineCrystal LED LCD" technology. Either way, generally speaking our test team like Acer screens, and the Aspire V3-551 gives no reason to buck this trend. The overall picture is clear, and colours are reproduced accurately. In terms of input options, the keyboard features black buttons, surrounded by a silver interior. The keys are evenly spaced, thus reducing the risk of typing errors, and the keys run the full width of the keyboard, including a number pad to appease the number crunchers amongst us. The touch pad is surrounded by the same black gloss finish as the exterior of the notebook - and offers good levels of control over proceedings. Acer have provided several connection options for this notebook - Ethernet, VGA, HDMI, USB 3.0 port, separate headphone and microphones jacks, and a multi card reader catering for SD, MMC, MS, MS PRO and xD cards. Weight is around the 2.6kg mark, which is just over average, and overall dimensions are 38.2cm by 25.3 cm by between 2.5cm to 3.3cm. So onto the pros and cons for this particular notebook model from the Aspire range. A good quality laptop - looks well designed and functioned well during the test period. A touch plain look - those who wish to stand out a bit more may want to look at Samsung or Sony's rnages instead. The Acer Aspire V3-551 offers decent value - at under £400 you get a lot of laptop for your money. For those looking for a functional laptop, you can do a lot worse than take a closer look at the V3-551.